Originally published at Bleeding Edge 4th Feb 2009. Inspired by Mike Swanson’s post of his fantastic Windows 7 Theme Pack from a selection of his wallpaper images and the already available Windows 7 Theme packs I have jumped aboard and gone a step further than Long Zheng’s post on RSS Powered Windows 7 Themes from Flickr users. The theme pack that I created uses a RSS feed of news photographs sourced from Agence France-Presse via Dave Winer’s FlickrFan project. There are a few things to note regarding the install of this theme pack in that a few extra steps are needed to customise your settings for the RSS feed in getting updates more frequently than once per day, or you can leave the defaults to once per day as the AFP photo feed is updated quite often so I would suggest 4 hours is a good middle of the road option. The RSS feed can download in excess of 500+ images per day with image sizes ranging from 0.5Mb to 1.5Mb each you will need to take this into consideration. Those of us here down under that have very limited download allocations per month I would definitely recommend not updating any sooner than every 4 times per hour, those in places around the world that have larger monthly download quota’s you can pick any setting you think that will not hurt your monthly download quota. Firstly download the AFP FlickrFan themepack to your desktop and open it open it up (double click) and you will be presented with a popup window ‘Subscribe to RSS Feed’ and you should click ‘Download Attachments’ and by default you are now up and running getting updates once per day. If you want the RSS feed to update more frequently open up Internet Explorer 8 and navigate to your ‘feeds’ folder (Favorites -> Feeds) and you will have a feed titled (http://feeds.feedburner.com/AFP-OPML-WIN7) and right click the feed and select properties and select ‘Use Custom Schedule’ and select how often you want the feed list updated, ¼, ½, hourly, 4 hours or daily and select how many items you want to store, the default is 200 and you can change this to a maximum of 2,500. The theme is set to change your background wallpaper every 3 seconds as drinking from the firehose without changing the background so often you would not get to see many of the images.When you do see an image and want to know more about the image you will need to open up Internet Explorer 8 and navigate to the RSS Feed and view the description contained in the feed as overlaying this text directly onto the images is well out of my league of wizardry. For more information on FlickrFan and the AFP photostream read Dave’s post A taste of FlickrFan, Om Malik’s Introducing FlickrFan, Read Write Web’s Dave Winer’s new photo viewing software or Scobleizer’s The MacMini HDTV revolution. If you do not have Windows 7 or this RSS Feed is just too much to download you can view the same images at the AFP OPML site created by Dave Winer. Thanks to AFP for supplying the images, Dave Winer and the FlickrFan project and WordPress for hosting the images. 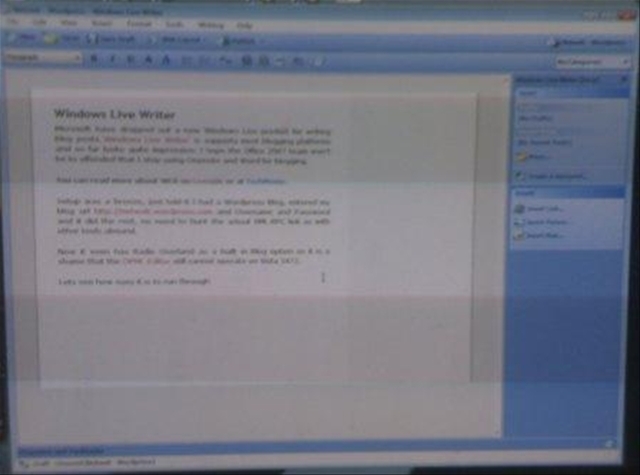 Microsoft have dropped out a new Windows Live product for writing blog posts.‘Windows Live Writer’ is supports most blogging platforms and so far looks quite impressive. I hope the Office 2007 team won’t be to offended that I stop using Onenote and Word for blogging. You can read more about WLR on Liveside or at TechMeme. Setup was a breeze and uses Really Simple Discovery (RSD), I just told it the URL of my WordPress Blog https://netweb.wordpress.com and Username and Password and it did the rest, no need to hunt the actual XML-RPC link as with other tools. Now it even has Radio Userland as a built in Blog option so it is a shame that the OPML Editor still cannot operate on Vista 5472. Otherwise this post would be going to http://blogs.opml.org/netweb . Lets see how easy it is to run through…. A quick snap from the Nokia N91 of the screenshot here cropped and reduced in resolution then dragged and dropped from my phone directly to the post. Added a drop shadow, a watermark and shifted the layout of the image to the right with text wrapping to the left. 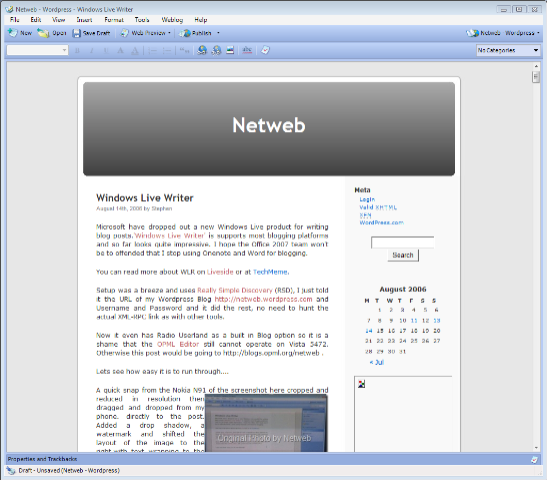 Click on View -> Preview and you see the actual preview of how it looks on your blog and not some daft preview mode. Trackbacks are easy to add, so are enabling or disabling comments and trackbacks for the post. Spell checking is fine and a drop down window for your post categories make this tool quite easy and creatively fun to use. Now just a last quick drop in of a Windows Live Local Map. EDIT: The only thing it suffed up during posting were the margins around the two screen shots with wrapped text above. Also if I manually edit the post from my WordPress Dashboard all the image links get screwed up. Thanks Robert, Keep doing what you do well…. You switched to WordPress because Matt added OPML support, do you still use Manilla, Frontier or the OPML Editor and are Microsoft doing anything at all within this realm? This is an area where we’ve seen Microsoft make huge adoptions. When I started at Microsoft three years ago they didn’t have RSS in any product. Now they have it in lots including Sharepoint, which is the intranet tool used by many many Fortune 100 companies. I can’t understate that enough. And, if I helped by saying that Microsoft product planners and marketers who didn’t support RSS should be fired then I’m very happy to have played my part. OPML is also supported by Outlook for inbound and outbound RSS feeds. I think you should watch what Ray Ozzie does in this area very closely. The stuff I saw before I left was astounding. Sharepoint looks very close to Manila. I am still using the OPML Editor and will use it more in the future at PodTech. I think I can ping you anytime I feel the urge now Tom and I have your e-mail address if I need it. Boston is indeed a fair hike from Melbourne. To be able to throw the swagover my shoulder and go camping with some fellow OPMLers would be fantastic to say the least. OPML brain storming with the likes of Tom, Kosso, Alex and many others would be extraordinary. A quick search on Webjet can get me a flight with United/Qantas there and back again for AU$1399.00 plus taxes. So that’s 48 hours flight time for the round trip and 48 hours on the ground talking everything OPML. Now to financing my first trip to the US of A. Anyone need some consulting work done for them over the next month?